You are here: Home » Cake Assembly – On the Fly! A baker’s best asset, other than a Kitchen-Aid stand mixer, is the ability to improvise. I was pretty limited on time and didn’t have too much in terms of pre-preparation, so I had to think of a dessert concept that I could pull together last minute, but still with amazing results. My pick? Ice cream-filled profiteroles topped with chocolate sauce. Profiteroles (cream puffs) are super-easy to make. REALLY. They are! I know I tend to repeat that phrase quite often, but profiteroles are something anyone can do. They are also very versatile – they lend well to both savory and sweet fillings. Heat 1 cup of milk and 1 stick of butter in a saucepan until the butter is melted and the liquid is just below boiling. Add 1 cup of all-purpose flour and stir quickly until no dry bits remain and the dough is roughly in one ball-shaped form. Take off the heat and add in 4 eggs. One at a time. The finished dough should be thick, sticky, but still pliable. Fill a pastry bag and pipe into mounds on a cookie sheet. (I used a small cookie scoop, feel free to use two spoons as well) Bake in a HOT oven (400F) for 20 minutes until puffed and golden. Reduce heat to 225F and cook a further 15 minutes until the puffs are ‘dry’ and sound hollow when tapped. I have cracked the door open a smidge at this step to prevent burning. One tip to prevent deflation – quickly pierce each puff on the bottom or side to further dry out the inside. I made the puffs a day in advance, but everything else would have to be assembled day of. The plan? Chocolate wafers would be the base for each puff and then topped with chocolate sauce. 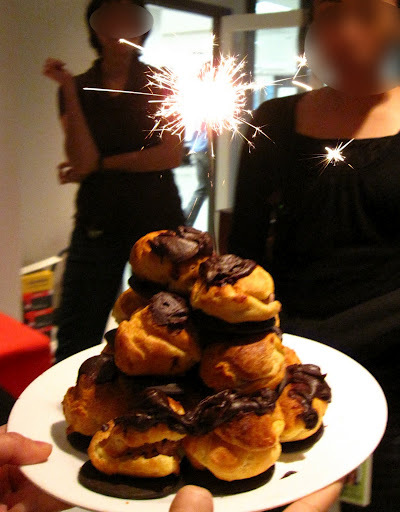 These wafer-puff-sauce mounds would then be stacked pyramid style on a plate, topped with a sparkler candle. Not bad, eh? The chocolate sauce was cobbled together with chocolate chips (from home), cream (coffee cream @ work), honey (@work), and coffee(@work!)! I only had about 30 seconds to take pictures – the brief period of time in between taking the cake out of the freezer (they were filled with ice cream) and the presentation. The wafer base (store bought) was a great touch – they added a much needed crunch and rich chocolate flavour to each bite. Not to mention a terrific platform for the puff itself! And it made it that much easier to serve! I should take this opportunity to mention that I did a guest post for a lovely coworker of mine on her fashion-themed blog, Being High Maintenance, Not Bitchy, (amen, sista!). Check out my post here – and explore her blog while you’re at it, it’s full of great ideas and inspiration!